Cost: This event is free for the public. For hours of operation and info on reserving a free spot, visit nfb.ca/BiidaabanTO. Details: Toronto’s Nathan Phillips Square is flooded. Its infrastructure has merged with the local fauna; mature trees grow through cracks in the sidewalks and vines cover south-facing walls. People commute via canoe and grow vegetables on skyscraper roofs. Urban life is thriving—and so are the languages of the Wendat, Kanien’kehá:ka (Mohawk) and Anishinaabe (Ojibway), this land’s first peoples. Torontonians and visitors alike can explore this extraordinary vision of Indigenous futurism as the National Film Board of Canada (NFB) virtual reality work Biidaaban: First Light has its Canadian premiere in Nathan Phillips Square, in a custom-built installation featuring five individual stations with VR headsets. “Biidaaban” is an Anishinaabemowin word that means “the first light before dawn.” It also refers to the idea of the past and future collapsing in on the present. 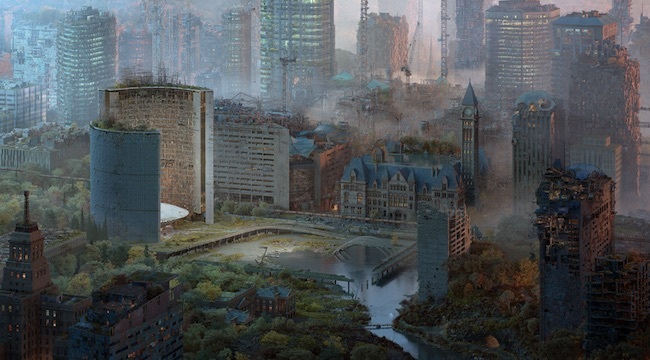 Biidaaban: First Light asks users to think about their place in history and their role in a possible future, as they move through a highly realistic Toronto reclaimed by nature. Gaze-based interactions allow users to engage with the languages of the place originally known as Tkaronto—providing a framework for understanding our place in a reconciled version of Canada’s largest urban environment. Produced by the NFB and presented in collaboration with the City of Toronto and the imagineNATIVE Film + Media Arts Festival, this interactive VR experience is by award-winning Anishinaabe artist Lisa Jackson, 3D artist Mathew Borrett, digital design and production agency Jam3 and the NFB’s Digital Studio. The project brings the two Toronto-based artists together with one of Toronto’s leading digital agencies and the NFB. Toronto’s landmark square is the setting for this awe-inspiring work that’s already wowed users at New York’s Tribeca film festival, earlier this year. Biidaaban: First Light will be presented again in Toronto, later this fall, at the imagineNATIVE Film + Media Arts Festival, October 17 to 21. « Halo Top Creamery Celebrates its First Seasonal Flavour in Canada!